Denny's biography was written by Mike Carey and published by Trevor Island in 1992. 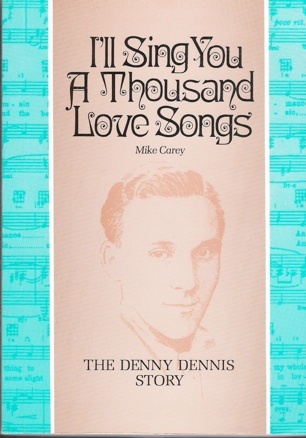 The publication coincided with the advent of the 'Denny Dennis Music Society' to promote Denny's career and to make more of Denny's recordings available to his many fans. The biography tells the full story of Denny's career and personal life with all its ups and downs. Mike Carey's account is superbly and sensitively written. Sadly, the 'Denny Dennis Music Society' is no more and the biography is no longer in print. It does appear on internet auction sites regularly and it is beginning to command high prices. For anyone interested in the full story of the career and life of Denny Dennis it is well worth trying to obtain a copy.